It wouldn't be a cyclocross season, if it didn't include a trip to Charm City! The 2017 Charm City CX race was my third year of racing in the great city of Baltimore. Over the years, I've grown accustomed to kicking off my season at this classic race (this was the 13th year!). Located near the Hampden neighborhood, adjacent to Johns Hopkins University, Charm City offers a balanced course and a fantastic venue in Druid Hill Park. The course itself requires a well-rounded set of skills including ample amounts of power, and technical finesse. It is, in my opinion, a classic cyclocross track. I arrived in Baltimore on Thursday morning, well before the event. In years past, I've had a few travel woes that have shaped how I prepare for and travel to races, one particular experience being the 2015 edition of this exact race. 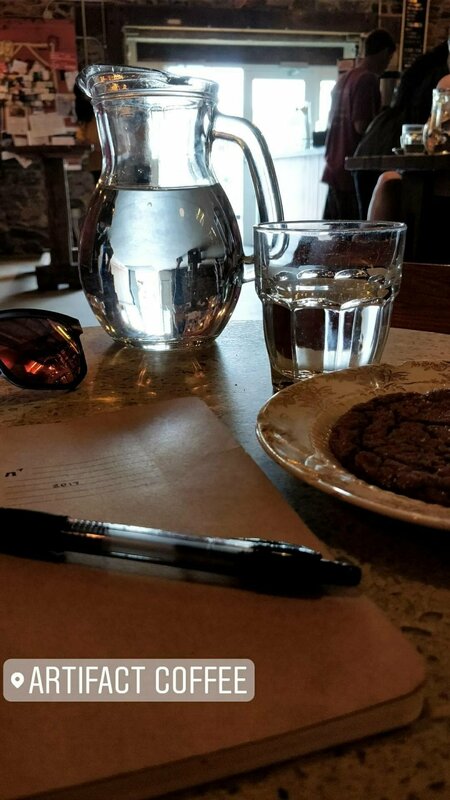 I've also learned where all the good coffee is, and made my way to Artifact Coffee for a quick bite to eat and some much needed caffeine. Fully caffeinated, I made my way out to my aunt and uncle's house in Mount Airy and got set building bikes and settling in for the weekend. Everything was going fine and well, until I was getting sorted out with tightening the bolts on my second bike. Torque wrench in hand, I looked down to see half of my stem bolt lying on the ground. "Uh oh," I thought. Fortunately, having enough time before the racing began on Saturday, I had plenty of time to find some assistance. I made my way to Patapsco Bicycle in downtown Mount Airy and left my bike in their capable hands while I went out for a spin. I was enjoying some beautiful gravel roads and the idyllic views of central Maryland when the guys from the shop called me to tell me they had fashioned a new bolt and fixed my bike! That was in less than an hour!! I am sincerely grateful for their help and will definitely be swinging by the shop on my future visits to Maryland. Bikes tuned and ready to go, I spent some time re-familiarizing myself with the course on Friday. Not much had changed from previous years for a majority of the course. However, one new feature was the MONSTER flyover that was constructed in the middle of the lower field. Seriously, this thing was like two stories tall! 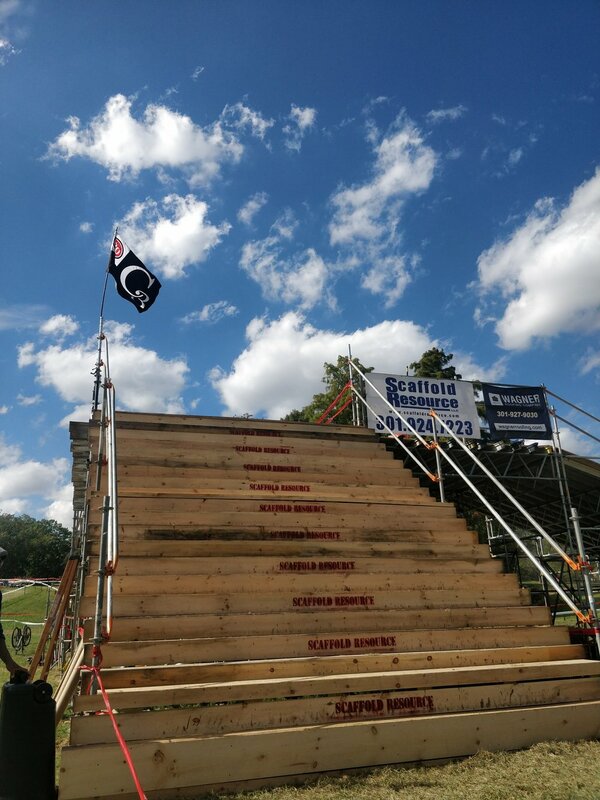 If they had an elevator or an escalator, I would have gladly taken the time penalty to not have to climb to the top each lap. Saturday was a relaxing start and I made my way to the course feeling relaxed and ready to go. As the second round of the inaugural US CX Cup, Saturday's Category 1 event had all of the hitters chasing the $10,000 series purse. With rising temperatures, there was no doubt the pace and the heat would make today a hard race. I took my spot on the left side of the grid in the 4th row - in a race this deep in talent, my one UCI point barely gets me to the middle of the grid. The left side ended up being the correct side to be on, as I moved up really fast off the line, somewhere in the top 15. Knowing I was a bit over my head in terms of positioning, I tried to dial back the pace a bit and not go too deep on lap one. As anticipated, the pace was blazing, turning a 5-minute lap for the opening prologue. As things settled down a bit, I started to pay for overstarting. While I rode smooth technically, the engine was starting to run out of gas. I found myself in some smaller groups and ebbed and flowed between riding solo and sitting in the group. The laps ticked down and I became more focused on making it to the lead lap. Putting in a few digs on my seventh and eight laps ensured I would achieve my goal and finish on the lead lap of the C1 race. Crossing the line in 27th, I definitely felt like there was improvement to be made, but I was satisfied with my technical riding and my best result to date in a C1. Leading into the weekend, Sunday's forecast called for 100% rain. Of course, I forgot a rain jacket and had already shipped my bikes without mud tires. Needless to say, I was a bit worried when I got to the course and saw some ominous clouds off in the distance. As luck would have it, the rain clouds would stay away and the moisture from the early morning dried out for faster conditions. The course itself was reversed from day one. We still summited the massive flyover but the course itself had a bit more "flow" to it, in my opinion. I took my same spot on the grid but rather than attack like I was shot out of a cannon, I was more reserved off the line and allowed others to push the pace into the red. The conditions were still hot and I was smarter about my pre-race hydration and packing an ice sock for the race itself. Taking the first couple of laps to settle in, I felt much better than I did on Saturday. Consistency was the name of the game as I started to pick off riders that went too deep off the line. The pace was still high in the race, and I was still starting to feel the pain creep in. I pushed as hard as I could and was still making time on the riders in front. However, going into the last lap, the referees showed some mercy on me and pulled me with one lap to go. I was confused, but also thankful to be done with suffering in the sweltering heat. That evening I had an awesome dinner with my Canadian teammates at Daniela Ristorante, an absolute MUST if and when you go to Baltimore. Stomachs full and mind happy, we parted ways and headed back home for a week of training and prepping for the next race! 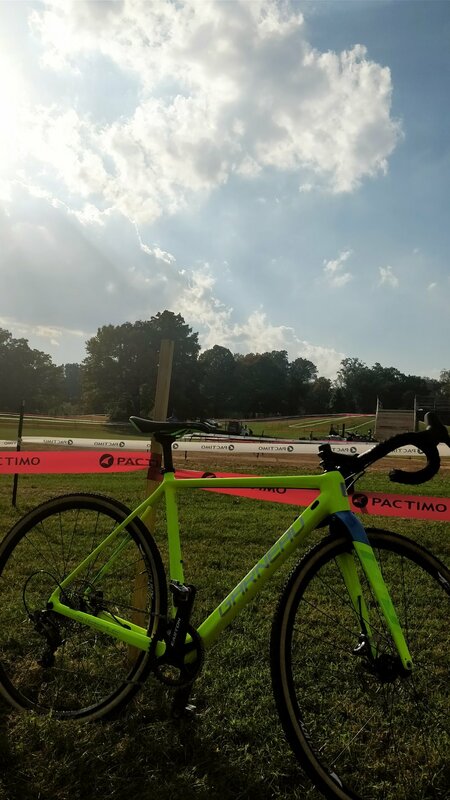 Next up is the DCCX race in Washington D.C. More on that to come, but for now be sure to follow Garneau-Easton on Instagram for the latest race reports, photos and videos!